The Chrysler 300 is a familiar behemoth on streets and highways that commands respect, if only in deference to the gross tonnage rule, which says the biggest boat gets the right of way. Nautical references aside, this is really an excellent car. The 2013 edition tested was sparkling black on the outside and lovely two-tone coffee coloured leather inside. Luxury is apparent the moment your posterior lands in the driver’s seat; the car smells like leather and looks like a gentlemen’s club, with elegant faux wood finishes, the leather dash, hot and cold cupholders, hot and cold driver’s seat, power sunshade for the back window. The interior is impeccable, and with the light carpets is not designed for those with a sporty lifestyle. As a big car, the 300C has a big engine to pull it around. This version had the 5.7L eight-cylinder Hemi under the hood, mated to a five-speed automatic transmission. This combination is more than enough to power the car’s bulk off the line gracefully, and offers a smooth, quiet ride on the highway with enough grunt to spare for passing or evasive maneuvers. It also handles well, taking corners with the assurance you’d expect from an all-wheel drive car. The suspension is not stiff, but rides comfortably without delivering that big-car floating feeling. Steering inputs are clean. The brakes are adequate, but did not offer a really substantial feel. A less forgiving pedal might improve this impression. As far as technology goes, this car has some nannies built in that seem essential in a vehicle of this grandeur. The back-up camera is, and the park-assist functions, including the cross-traffic sensor should also be standard equipment on the 300. Its sheer size makes these sensory aids invaluable, especially when driving in the city or in close quarters like parking lots. If you are going to pay $50,000 for a car, it makes sense to protect your investment with a little tech. Speaking of technology, the touchscreen interface in this car is superbly intuitive. It passed my BlackBerry Bluetooth test easily, requiring only moments to achieve connectivity, with no need to consult a manual. While underway the phone was audible and clear, and the optional stereo system ($995) offers 10 speakers, sub-woofer and a 552-watt amp. With the stereo humming, phone connected, hot drink staying hot, and cool drink chilled it was hard to park the car and go in the house, let alone the office. It’s got all the creature comforts, room in the trunk for luggage, (or samples, deliveries, bodies or whatever your profession requires), and enough space in the back seat to hold meetings. The 300C is an excellent car for the road warrior who spends serious hours in the rolling office. The 2014 Mazda 6 GT is a seriously good-looking car, reminiscent of a couple very high-end luxury cars from Europe, and as the least expensive of the group reviewed here, it has a lot to recommend it. From a styling standpoint, the exterior is sleek and sinuous, especially in the Soul Red Mica paint, while the interior is understated and well designed, and appointed with soft touch materials. It’s a well-put-together car, with a good quality finish. The GT model tested had a power, eight-way adjustable driver’s seat with memory, and supportive sides, making it easy to find—and keep—a comfortable driving position. The cabin is ergonomically friendly and offers the driver good front and rear visibility. What you sacrifice by not moving to the luxury segment is power and refinement in the drivetrain and engine. With only 184hp, this car is no powerhouse, but it is responsive and does have sufficient grunt to pass when asked. It is a bit noisy at times, however, with the occasional rough shift and odd sound from the transmission. 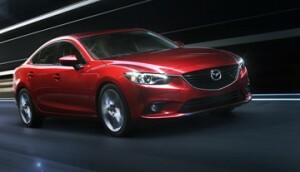 From a handling perspective the Mazda 6 is very good. Its suspension is firm, offering a moderate ride, and it steers and handles well, although with a wide turning radius. Stability control and traction control are standard features. Braking is smooth and controlled with ABS on discs all round. The vehicle tested had the technology package as an option, adding SiriusXM satellite radio, “Smart City Brake Support”, “Forward Obstruction Warning”, “Mazda Radar Cruise Control”, “High Beam Control System”, and the “Lane Departure Warning System”. Blind spot monitoring and rear cross traffic alerts are standard at this trim level. In fact, the GT car is packed with standard features that make it seem to be well above the snack bracket it’s actually in. This car has luxury written all over it—except on the price tag. The Volvo XC60 T6 AWD R-Design Platinum looks like it could be a fun ride. From its outward appearance in wildly bright blowtorch-bottle blue (aka Rebel Blue), to the fact that it has 325 horses hiding under the hood, the crossover wagon exudes intent. But once you get out of the driveway, you soon learn that the intent is all aimed at one thing—keeping the streets safe. This is a serious vehicle, equipped with some heavy-duty safety gear both for its occupants and people around it. 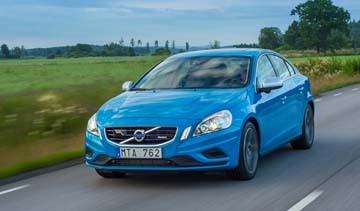 Volvo is well known as a proponent of active and passive safety systems, and this car is loaded with them. From advanced security technology to airbags, to frame innovations and radar-based lane- and distance-keeping sensors to collision avoidance technology and design features to mitigate the effects of an impact on pedestrians, there is a lot packed in here. The only problem is it doesn’t all work that well. The blind-spot information system (BLIS), for example, is extremely twitchy. There is a small orange light in the corner where the side mirror attaches to the car that illuminates when there is something in your blind spot. Great in principle, except in the two versions of this car driven it doesn’t work in the rain—which is when you likely most need extra help seeing into your blind spot, especially as the car’s B-pillar is huge. Water droplets appear to confuse it into thinking there is a vehicle where there is nothing. It also got confused in clear, dry weather, so Volvo may want to iron out the bugs in this system for its next iteration. The good news is you can easily turn off this and the collision avoidance and park assist systems. But if you are in the market for a car with comprehensive safety systems, you want to be able to use what you’ve paid for. On the plus side, the crossover is driver-friendly with an uncluttered dash and easy to read displays. It has a huge cargo compartment, split folding rear seats, and an under-floor compartment for valuables. The interior is luxuriously appointed, it’s quiet on the highway, and offers comfortable seating for four adults. Its little brother, the S60, offers all the same technology and safety features in a more city-friendly four-door sedan format. This one is a stealthy highway sport sedan with power to spare, mating the same 325hp powerplant to a much lighter vehicle. Order either of these vehicles without the optional nannies and you have a very safe, highway-friendly, spacious car or crossover that looks good, drives exceptionally smoothly and can handle work and family equally well. 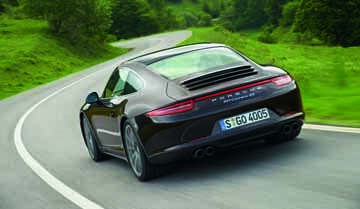 The 2013 Porsche 911 Carrera 4S is a big car. The legendary 911—celebrating its 50th birthday this year—started life as a tiny coupe and has been steadily growing. Now, at mid-life, it’s developed some of the middle-age spread of people the same age. The “991” 911 no longer has the look of a nimble sports car. It’s longer, beamier and higher than before. Still, when you slide into the cockpit and fire up the six-cylinder, 400hp beast crouched just aft of the back seats, you know this is something special. And one thing hasn’t changed—people do cast admiring glances your way. On the road and on the track this car has power, handling and grip to spare. It’s a driver’s dream. Four-wheel drive makes the coupe amazingly stable through corners and the seven-speed manual transmission is smooth—shifts are easy. Pushing the right pedal down gives instant gratification. Remembering to use seventh gear takes some work, but once there, the car cruises on the highway, purring along, probably wishing it was doing autobahn speeds. In the city, the automatic shut off feature shuts down the engine at stoplights, firing it up again when you put the clutch in. Great for long lights or traffic jams, but in regular stop-and-go driving, it was sometimes slower than the driver, leaving a moment of hesitation as the car re-started. The feature is toggled on or off with a button on the console, so it’s easy to over-ride. You can also toggle on the exhaust sound enhancer, sport suspension and the traction control systems. As with all the new Porsches, there is a tremendous amount of technology and complexity built in, and a lot of it needs to be mastered by the driver. When you spend this much for a car, it really pays to read the manual carefully and learn how to take advantage of what you’ve got. It has a few design quirks. For example, the USB port is in the glove box, out of the driver’s reach, making it hard to change music while on the road. There is also quite a bit of road noise. That said, this 911 is not a stripped down, visceral ride. It’s comfortable, luxurious, and elegant, and would be a rewarding ride every day of the year.